Cops run into all kinds of characters on the job. 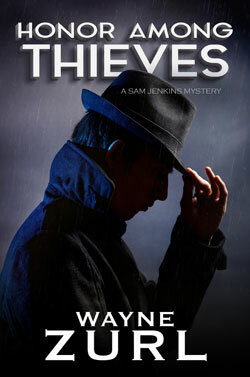 But when Chief Sam Jenkins meets four people from his former life as a New York detective, it throws him for a loop. The first was a low level gangster named Carlo “Carly Nickels” DeCenzo—lying on a slab in the Blount County morgue with Sam’s name and phone number written on a scrap of paper in his pocket. Next there’s Gino Musucci, infamous Northeast crime boss who says he wants to retire and relocate—to Sam’s town of Prospect, Tennessee. And there’s Dixie Foster, Sam’s former secretary and the woman who wanted to steal him away from his wife. Sam wonders why she’s turned up after eighteen years. With DeCenzo’s murder unsolved, another body shows up in a Prospect motel—that of a retired detective and co-worker from Sam’s past. At 9 p.m., Kate and I sat on a loveseat in the living room watching a PBS special on Yellowstone National Park. Just as a small herd of bison began trudging through a soggy meadow in the Lamar River Valley, the phone rang. A county detective named Bo Stallins requested my presence in the morgue at Blount Memorial Hospital. Twenty minutes later, I parked my unmarked Crown Victoria in one of the police spots near the emergency room entrance. A chill November breeze blew down my neck and caused my open jacket to flutter. As I approached the building, double sliding doors parted like the Red Sea, and I found Stallins leaning against a wall next to the triage nurse’s station. The tall man flexed his shoulders and pushed off the tile. He handed me a wrinkled 3×5 card with Sam Jenkins Prospect Police and the office phone number written on the face. Not exactly the answer I wanted to hear. We walked through institutional green hospital halls, took an elevator to the lowest level and adjourned to a dimly lit corner of the morgue. The unmistakable shape of a fairly large body lay on a stainless steel gurney under a sage green sheet. Stallins and I stood by as a young attendant with a crew cut and long sideburns lifted the sheet to show me a face attached to the body. “Know him?” Bo asked as he unzipped his black leather jacket. An oval Sheriff’s Department badge hung on his belt just forward of a Glock .40 caliber pistol. “Nichols, ya say?” Bo asked. “N-I-C-H-O-L-S?” He spelled it out. He looked confused. The morgue attendant was busy picking at a hangnail on his left thumb and paid no attention. Bo still looked a little skeptical. “It was that kind of neighborhood. And I doubted any witness would want to get on the wrong side of Carlo’s old man, Alphonse DeCenzo. He was a family man if you know what I’m saying.” I used my index finger to push my nose to the side. Bo looked confused again. Stallins was in his mid-forties and a hair over six-foot. I’d known him for almost four years and had watched his hair turn gray from the job. “Yeah. Makes our jobs easier.” I took the end of the sheet and pulled it down to Carly’s waist. Just below the intersection of autopsy stitches that formed a Y and closed up Carlo’s chest cavity, someone had fired two shots into his ten-ring. They looked about nine-millimeter size. The young man nodded, took a bite of cuticle and covered the body. Bo and I rode the elevator up two floors and walked back to the hospital lobby. A Wednesday night in Prospect, Tennessee is about as busy as Christmas in Tel Aviv. We found only three cars in the parking lot at the pub and four patrons sitting at tables inside. I ordered a pint of black and tan and got Bo a Budweiser. We sat at a small round table near the dart board. Bo took a big sip of his Bud, stretched out his long legs and got comfortable. Bo drank more beer. Two customers picked up their check, called out a good-bye to Reggie, the barman and headed out into the dining room to the cash register. I downed a bit of black and tan and continued. Another one of the bar patrons picked up and left, and I looked at my watch.